We are set to perform a house concert in Cleveland Heights, Ohio Friday, October 19th, 2018. Arrive after 7:30pm, Music starts at 8pm. Seating is extremely limited, so hurry! 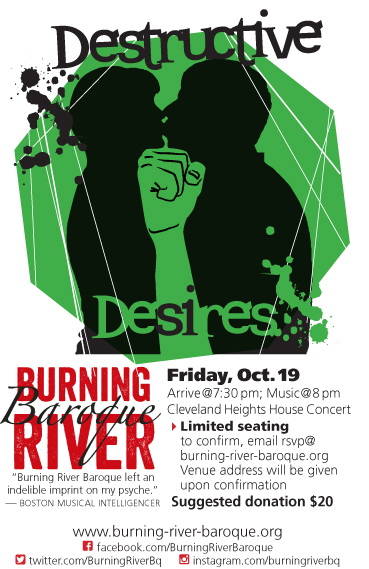 To reserve your seats, email rsvp@burning-river-baroque.org with the number of seats needed. Address for the venue is given upon confirmation. Admission is a suggested donation of $20 to go directly to the performers. The profound worldwide impact of the #metoo campaign was a striking beginning to what will hopefully be a continued dialogue about the abuse of power and consent in all types of relationships. In reading the countless stories of sexually assaulted men and women, several general trends emerge. While abuse happens in numerous forms between all combinations of genders, we cannot ignore the fact that in far too many instances women are victimized by men. Frequently, these men behave in ways that make it seem as though they feel that they are entitled to anyone they fancy or that they are simply incapable of controlling their desires. Our program looks beyond contemporary narratives of consent and the abuse of power, and focuses on stories old enough to be in our collective unconsciousness including the Bible, Greek mythology, and the implied power of Cupid. The ideas perpetuated by these myths have continued to be acceptable for millennia and have not only destroyed countless women’s lives but have also demeaned men. We see change as starting with the acknowledgement of the ludicrous nature of these timeless stories, which is what our program aims to do. Accessibility: Burning River Baroque is committed to providing excellent experiences, engaging the broadest possible audiences, and breaking down barriers to participation. All concerts can provide large print programs. Requests for professional services should be made at least two weeks in advance. For all questions, contact directors@burning-river-baroque.org. This house has a few stairs, so it is not fully wheelchair accessible.